The Musée du Malgré-Tout in Treignes is specialised in all what concerns the Romans and what and who preceded the Romans. This is a good adress for information about the archeological sites mentionned under-here.Besides this the museum houses a set of reconstructions of prehistoric houses, when people lived yet from hunting. Regularly the Musée du Malgré Tout organises an exhibition around an archeological theme. On the Tienne des Noël, along the old road between Fagnolle and Matagne-la-Grande,8 km from La Calestienne, there are restaurated remnants of aGallo-roman temple complex. This site includes a walled area of eighty by eighty meters and a central temple in which two building phases can be distinguished, basing oneself on the different types of mortar. In 1979 the remnants of a Roman villa have been found just southwest of Treignes, 14 km from La Calestienne: the "Villa des Bruyères". At least eight buildings are spread over six hectares. 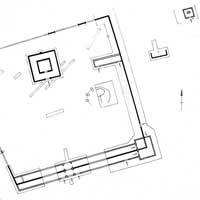 The foundation of which you have a plan right here have been restaurated and can be visited. Just after passing the borderline with France, in Vireux, at 15 km from La Calestienne, the vestiges of defence walls and the remnants of a big bread oven testify of the Roman Fortification, from where out the Romans could controll the traffic on the river Meuse. After years of excavations this site has also been restaurated and is now open for public. The castle ruins of Dourbes are all what is left of the "Château de Hauteroche", which has been broken down in the sixteenth century, just like the castles of Nismes, Fagnolle and Couvin. Remarkable are the thick walls on the side that is easily accessible in comparison with the thinner walls on the steep side. The ruins of this thirteenth century castle are freely accessible. From these ruins you have a splendid view on the Viroin valley over Dourbes and further on till Frasnes.